I’ve been debating what I want to write about this weekend. I have stockpiles of photos, some recent, some not, sitting in my “to be sorted” file folder that I’ve sifted through indecisively a few times this weekend. Nothing was grabbing me. There were several perfectly interesting subjects there, which I was quite intrigued by when I took the photos, but nothing that really spoke to me today. Purely in the metaphorical sense, of course; photos don’t actually speak to me unless I’m completely intoxicated on chocolate. So I waffled, and took an extra day to think about it. 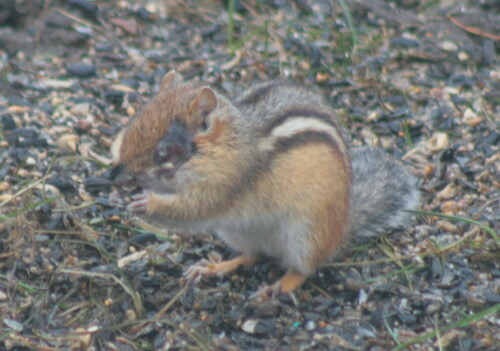 Then this afternoon, I peeked out the window while I waited for my tea to steep, and underneath the feeders was a chipmunk. I’d actually seen this guy, or I presume it was the same guy, early last week, but I’d been in my car about to head off to my parents’, and my camera was packed away. It’s not like he was going anywhere. Still, I’d been pleased to see him (or her) there – it’s a sign that spring is near. 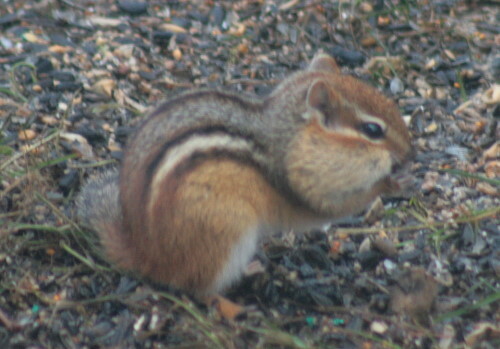 Although chipmunks aren’t true hibernators – they enter a state of torpor and rouse from time to time when the weather is slightly milder to feed from the stores of food they built up in the fall – we haven’t seen one at the feeders (or anywhere else here) since before the snow fell. I think he’s got a nest somewhere under the old cabin (now storage shed), as we usually see him near there. In an ordinary forest situation they use burrows that they dig underground, but I have a feeling that this guy may have decided to save himself some time and created himself a cozy space underneath the floorboards of the century-old building. He was doing well for himself under the feeders. The Red Squirrels have figured out to jump from the lilac bush onto the feeder platform, but the chipmunk prefers to keep his feet on the ground. 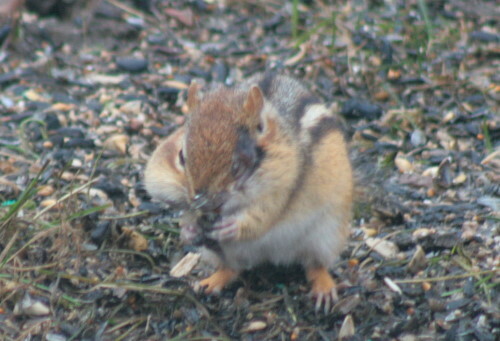 Still, there was enough dropped or discarded seed down there to fill out his cheek pouch quite nicely. Each pouch can hold as many as 35 sunflower seeds, and obviously considerably more of the smaller millet, which is probably what he was picking up since the chickadees and other feeder visitors would dig through the millet for the sunflower. This allows them to carry quite a bit back to the burrow for storage when they find an abundant food source. They push it back out of their cheeks from the outside using their paws, like you might squeeze a tube of toothpaste. 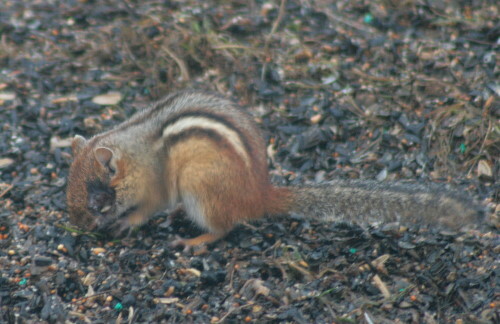 So I was watching this little guy gathering seeds under the feeder when he turned around and faced the other direction. And I was shocked to see that he was missing virtually the entire left side of his face. I actually had to grab my binoculars to have a closer look. His face was so badly damaged that he was unable to use that cheek pouch, which accounts for why the one on the other side was crammed fit to burst. He has no left eye, just a slight depression where one once was. At points I thought I saw a seed fall from the side of his face and wondered if he was missing part of his cheek, although I can’t be sure it wasn’t one that had gotten stuck to the wound when he was pushing his nose around in the seed litter. I couldn’t tell how fresh the wound was. It wasn’t bleeding, didn’t look red or raw or leaking pus. It was hard to tell if he was in any pain, but he didn’t seem to be trying to avoid touching it, his behaviour was normal. This sort of injury is most likely to result from an encounter with a predator, but I don’t know what might have done the damage. Hawk? Fox? Fisher? Snake? And how did one side of the face get damaged while the other side appears to have remained unscathed? Or the rest of his body, for that matter. So then I wondered if it might be an infection. Will mange destroy the eye like that? Some sort of flesh-eating bacteria, perhaps? Do wild animals get that? Should I be concerned for our other feeder-visitors, or for Raven? Or could it even maybe be a birth defect of some sort? It doesn’t seem to have unduly affected him, in any case. He seems healthy enough. 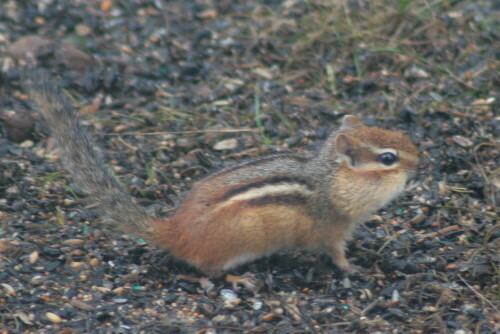 He didn’t look unusually thin, and he was clearly finding enough food (presumably also eating it) under our feeders. He was alert and active, dashing off to the cover of the lilac bush when the birds took flight, moving around at a normal pace. Presumably it would affect his depth perception, but it didn’t seem to be an issue at least during the time I was watching. I’ll have to keep an eye out for him this spring and see if he sticks around, and how he does. He won’t be hard to identify, anyway. The name in the post title, incidentally, is after legendary myrmycologist Edward O. Wilson, who was blinded in one eye as a child during a fishing accident. It was this reduced vision that led him to study insects, which were easier to observe than mammals or birds. He actually started on flies, but when mounting pins became scarce during WWII he switched to ants, which could be stored in vials. And the rest, as they say, is history. I didn’t know that about E.O. Wilson! Great post. Let’s hope this little guy (or gal) has a long, healthy life in spite of this disadvantage. Could the wound be the result of a botfly? It is so hard to witness an injured animal. I had an issue with birds and avian pox and/or conjunctivitis. It’s amazing how high spirited they seem to remain. Just because I was curious, I sent this on to a rehabber friend of mine. She said it was most likely an injury, but could be squirrel pox (which creates tumors all over the infected animal). She gave me the email address of a squirrel specialist just in case you wanted to try to “save” this chippie. Let me know. She and I are both of the opinion, though, that this chippie seems to be doing fine on its own. I’d heard about E.O. and the mounting pins, but didn’t know that about his eye. Haven’t seen any of our chippers yet. The poor little critter seems to be doing just fine. I always find myself intrigued when the disadvantaged appear to overcome the obstacles. Survival is hazardous enough when you’re 100% healthy, so kudos to those who pull it off with less than all their faculties. Loved this post and photos. Thanks for the thought that you put into each one. I don’t know if it’s the same in North America, but in southern Africa, small raptors will often target the eyes of mammal prey that’s unusually large. I’ve seen a pale chanting goshawk (who usually preys only on mongoose pups) attacking an adult slender mongoose by repeatedly trying to gauge out its eyes. As a consequence of this behaviour, there was almost always one or two one-eyed meerkats in our study population in the Kalahari. They behaved quite normally, including undertaking there usual share of sentinel duty! It is possible the injury was caused by a road accident. I observed a gray squirrel grazed by a moving car as it attempted to cross the road. The motion of the car pulled it in towards the tire as the car passed though the squirrel never went under the tire. It ran quickly back into our yard. This particular squirrel had markings that allowed me to identify it. Several days later I saw it with a horrible and extensive surface burn/ injury to the face on the side that met with the tire. The eye was gone. The wound was not bleeding and the squirrel was sitting at the feeder casually eating seed. Perhaps this chipmunk experienced a road or other accident as well. aww, little guy. very interesting about e.o.wilson. have to manually code with HTML. I’m starting a blog soon but have no coding experience so I wanted to get advice from someone with experience. Any help would be greatly appreciated!